Don Taddeo Barberini [1603-1647], Rome, by 1645; his son, Prince Maffeo Barberini [1631-1685]; remained in the Barberini family collection until at least 1922; (Count Alessandro Contini-Bonacossi, Rome); purchased 1932 by the Samuel H. Kress Foundation, New York; gift 1939 to NGA. Taddeo left Rome in 1645 for Paris, where he died two years later. The painting is listed in his posthumous inventory of 1647-1648 and again in Maffeo's posthumous inventory of 1686; both are published in Marilyn Aronberg Lavin, Seventeenth-Century Barberini Documents and Inventories of Art, New York, 1975: 196, no. 168, and 400, no. 138. This information was provided by Burton Fredericksen and Margaret Clark of the Getty Provenance Index (letter of 24 February 1986, NGA curatorial files); Eduard Safarik, "Domenico Fetti 1983", in Il Sciento nell'arte e nella cultura con riferimenti a Mantova, Mantua, 1985: 52, had reached the same conclusion. Fern Rusk Shapley, Paintings from the Samuel H. Kress Collection: Italian Schools XVI-XVIII Century, London, 1973: 68, and still in Shapley, Catalogue of the Italian Paintings, 2 vols., Washington, D.C., 1979: 1:178, was unaware of the inventories published by Lavin and of other versions of the subject. She thus conflated references to these versions in the Gonzaga, Crozat, and various English collections into a single erroneous provenance for the Barberini-Washington panel. Lavin 1975: 687, placed the painting owned by Taddeo and Maffeo in the Galleria Corsini in Florence, but as Fredericksen noted, her reference is to Alinari no. 45390, which is a photograph taken of the NGA painting when it was exhibited at the Florence exhibition in 1922. The expert opinion by Roberto Longhi, dated 1932, on the back of a photograph in the Kress Files, NGA, states that this is the painting he discovered in the Barberini collections in 1922 and selected for the Florence exhibition that year, where it was listed as still being in the Barberini collection. According to Shapley 1973: 68, and 1979: 1:179. Mostra della pittura italiana del seicento e del settecento, Palazzo Pitti, Florence, 1922, no. 409. The support is a poplar panel (populus sp.) with vertically oriented grain. The ground is a thin layer of yellowish brown textured with brushstrokes, which shows through thinly painted passages such as the foreground steps. The blue of the sky was painted over a locally applied layer of white underpaint. The architecture was painted first, its main lines having been incised into the ground layer. Broad areas were left in reserve for the figures, which in many cases overlap the architecture. Infrared reflectography reveals underdrawing in the form of broad, sketchy contours for the background musicians and for one of the arches. The paint application varies from pastose opaque whites in the architecture and some details, to thin semitranslucent glazes for the darker drapery folds, costume, and curtain. The paint was applied mostly wet-into-wet, but the added details were only partially blended into the underlying paint layer. Red grid lines, possibly in chalk, are apparent only along the bottom edge of the painting, over the white paint of the steps. Fingerprint texture, employed in selected areas, is most evident in the buttocks of the kneeling figure in red and the faces of the two central musicians. Several artist's changes are visible. The top edge of the wall on the left was shifted upward by about 1 cm, covering the bases of the urns, and the arms of the kneeling figure in red were shifted slightly. The musician playing the wind instrument was also changed: his right arm and leg were originally raised and extended out further, and his gaze was originally directed toward the musicians rather than the viewer. At first he wore a dark beret like hat over the back of his head, but this was changed to a red cap similar to that seen in the engraving after the Crozat version of the composition (see text). A line next to his chin may suggest that he was originally shown playing a violin. The support has been thinned to 0.7 cm and subsequently cradled at an unknown date; wooden edge strips have also been added. The paint is abraded in the upper sky, the faces of the musicians and background figures, and the entablature above the left arch. These areas were inpainted in 1992-1993 when the painting was treated by Carl Villis. Conservation records show that Stephen Pichetto removed discolored varnish and restored the picture in 1932. Preliminary Catalogue of Paintings and Sculpture. National Gallery of Art, Washington, 1941: 63, no. 199, as The Parable of Dives and Lazarus by Domenico Feti. Book of Illustrations. National Gallery of Art, Washington, 1942: 243, repro. 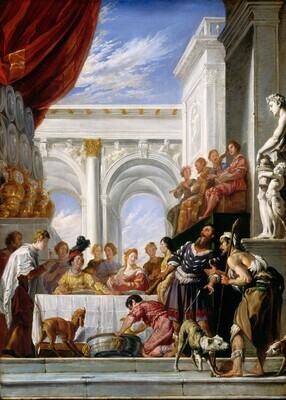 102, as The Parable of Dives and Lazarus by Domenico Feti. Michelini, Paola. "Domenico Fetti a Venezia." Arte Veneta 9 (1955): 135-136, fig. 148. De Logu, Giuseppe. Pittura veneziana dal XIV al XVIII secolo. Bergamo, 1958: 276. Paintings and Sculpture from the Samuel H. Kress Collection. National Gallery of Art, Washington, 1959: 221, repro., as The Parable of Dives and Lazarus by Domenico Fetti. Askew, Pamela. "The Parable Paintings of Domenico Fetti." The Art Bulletin 43, no. 1 (March 1961): 31-32, fig. 9. Reprinted in Seventeenth Century Art in Italy, France and Spain The Garland Library of the History of Art 8. New York, 1976. Perina, Chiara. "Pittura." In Mantova. Le Arti. 3 vols. Mantua, 1965: 3:464. Summary Catalogue of European Paintings and Sculpture. National Gallery of Art, Washington, 1965: 49, as The Parable of Dives and Lazarus by Domenico Fetti. Lehmann, Jürgen. "Domenico Fetti. Leben und Werk des römischen Malers." Ph.D. dissertation, Johann Wolfgang Goethe-Universität, Frankfurt am Main, 1967: 123-124, 209, no. 72. Moir, Alfred. The Italian Followers of Caravaggio. 2 vols. Cambridge, Massachusetts, 1967: 1:81, n. 40; 2:70. European Paintings and Sculpture, Illustrations. National Gallery of Art, Washington, 1968: 42, repro., as The Parable of Dives and Lazarus by Domenico Fetti. Moir, Alfred. "A Fetti Drawing in Munich." Pantheon 28 (1970): 529, n. 11. Shapley, Fern Rusk. Paintings from the Samuel H. Kress Collection: Italian Schools, XVI-XVIII Century. London, 1973: 68-69, fig. 125. Shapley, Fern Rusk. Catalogue of the Italian Paintings. 2 vols. Washington, 1979: I:178-180, II:pl. 124, as The Parable of Dives and Lazarus. Pallucchini, Rodolfo. La pittura veneziana del sciento. 2 vols. Milan, 1981: 1:138. Safarik, Eduard. "Domenico Fetti 1983." In Il Seicento nell'arte e nella cultura con riferimenti a Mantova. Mantua, 1985: 52. Safarik, Eduard. Fetti. Milan, 1990: 16-17, 81-82, 87-88, 122, 131-133, repro., 221. De Grazia, Diane, and Eric Garberson, with Edgar Peters Bowron, Peter M. Lukehart, and Mitchell Merling. Italian Paintings of the Seventeenth and Eighteenth Centuries. The Collections of the National Gallery of Art Systematic Catalogue. Washington, D.C., 1996: 89-95, repro. 91.